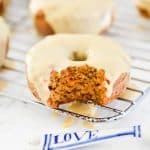 Paleo carrot cake donuts are the perfect dessert. The icing on these donuts is also incredible. They are grain free, gluten free and dairy free. You can also eat these donuts for breakfast or as a snack. They also store well in the freezer if you don't eat them all.